The No. 99 letter brake is a unique small bending brake, with its slotted jaws and apron, is specially designed for bending sheet metal pieces which have one or more bent flanges or seams already formed, such as when bending channel letters. 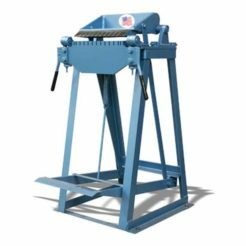 It is also used for straight bending of sheet metal up to 12″ in width. The maximum capacity is 20 gauge mild steel.